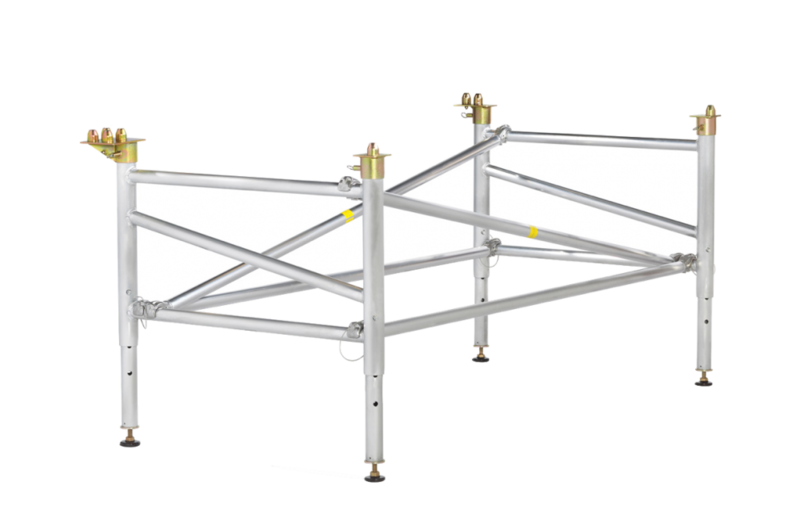 The SC9600 Bridge Support System “bridges” platforms from right to left and front to back. The SC9600 Bridge Support System consists of two end frames that lock together with both horizontal and diagonal snap bracing. Also included are four top plates in single, dual or quad node design. The SC9600 is available in fixed or adjustable heights and in two versions: Arena style and All-terrain style. The Arena style SC9600 adjusts with interior tubes that telescope upward from the top of the frame. This design allows the platform height to be adjusted quickly, often with the frames still in place. The All-terrain style SC9600 is great for outdoor use on uneven ground. The interior tubes, which telescope downward from the bottom of the frame, allow each of the legs to be set at different heights.